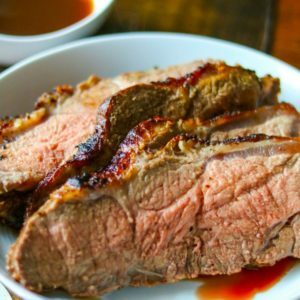 New York Strip Roast With Brandy Au Jus: Move aside prime rib, this is a lighter take on a Steakhouse favorite that is more delicious than the original! Step by step instructions on how to make the most flavorful NY Roast you have ever had. My husband’s favorite tradition at the holidays is Christmas Dinner, when I make a New York Strip Roast. For many years, my parents would make Prime Rib Roast from Self Proclaimed Foodie. and we all loved it. However, I wanted a lighter version of this classic Christmas Recipe. So I traded in the decadent prime rib for a New York Roast. Did you know a New York Strip is actually a fairly lean cut of meat? Did you know it can be seasoned and prepared in same fashion that a Prime Rib Roast is made? AND NOW WE HAVE A NEW TRADITION. In fact my husband says he loves my New York Strip Roast as much as Prime Rib–there is no better compliment. Try this roast for yourself–I think you will start a new holiday tradition. Allow the meat to sit on the counter for at least 1 hour. Leaving the meat at room temperature will allow for more even cooking of the NY roast. Brandy Au Jus could not be easier. In a saucepan bring beef stock, a few springs of thyme, a few garlic cloves, salt, pepper, and a generous splash of brandy to a boil. Reduce heat and simmer for 1 hour at a very low heat. Place a digital thermometer in the center of the NY roast and place into an oven that is set to 450 and roast for 15 minutes. Lower the heat to 350 degrees and roast until desired temperature is reached. How long should you cook your New York Roast? Well Done: buy a cheaper cut of meat and call it a pot roast!! You need to take your NY Strip out of the oven when it is 10 degrees BELOW the temperature. It will raise another 10 degrees as it rests. It needs a nap…..okay, not really, but it does need a chance to let the juices redistribute through the meat. This step is crucial. Rest it for at least 20 minutes or up to 60 minutes. Step 6: Serve the Roast with Au Jus and Enjoy your family. How make perfect oven roasted New York strip served with a homemade brandy au jus. With machine running, drop 6 garlic cloves into processor; blend until finely chopped. Add 2 tablespoons thyme leaves, oil, 4 tablespoons salt and 2 tablespoons pepper and process until paste forms. Pat meat dry with paper towels. Rub meat all over with herb paste--there may be some of the rub left over. Cover; chill at least 12 hours and up to 48 hours. Allow meat to come to room temperature while oven heats to 450. Roast meat 15 minutes. Reduce oven temperature to 350°F. Roast meat until instant-read thermometer inserted into thickest part of meat registers 120°F for medium-rare, about 35 minutes (or 130°F for medium, about 40 minutes). Remove from oven; let stand 20-30 minutes. The temperature should rise about 10 degrees as the meat rests. Serve with au jus on the side for dipping. Prepare the aus jus by bringing the beef stock, 2 teaspoons salt, 2 teaspoons pepper, 4 fresh thyme stems, 4 cloves of peeled garlic and the brandy to a boil. Reduce to low and simmer for 30 minutes to one hour. Prime rib has honestly never been one of my favorites either. I would pick this any day! I rarely care for any red meat…but this is one piece I crave. This looks tasty! Now I want a steak for dinner, haha. Thanks for joining us for the Retro Repin Party this week, Hopefully you’ll join us next week too. 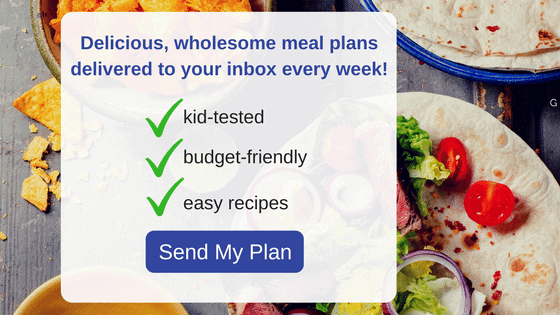 It is definitely worthy of a Holiday meal, even though we may crave it so much more often 🙂 And it is SO easy, it could be done anytime you want! 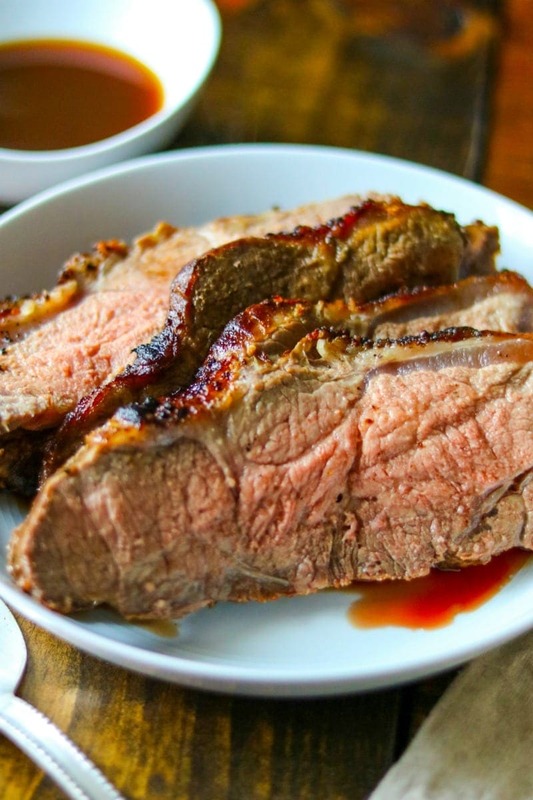 Your New York Strip Roast with Brandy Aus Jus would be a special addition to a holiday dinner. 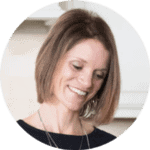 Thanks so much for sharing with Full Plate Thursday and hope you have a great week. Thanks Kimberly!! It is DIVINE! “Au jus” (correct spelling) is French for “with juice”. It’s not a noun. You could say “strip roast with a brandy jus” to be more correct. This looks fantastic! I’ve never been good at making a strip roast (though where I live we refer to them as Kansas City strips) but your recipe gives me confidence. Pinning! I hope you have as much success as I do with this Kansas City Strips 😉 It has NEVER disappointed. 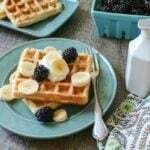 The addition of brandy makes this one of my favorite recipes! It’s company worthy and easy to make! Thanks Renee! I am so glad you enjoy this so much! So glad you enjoyed Chrissy! The brandy does take this over the top! Hi Corina! It depends upon how large your roast is and what temperature you want your roast to. For me, it is typically 15 minutes at 450 and then 40 minutes at 350 for medium rare for a 4-5 pound roast. Hope that helps you determine timing. Enjoy! Your desription of the cooking process and the recipe don’t match and would lead to overcooking! The description says take out of the oven 10 degrees lower than ultimate temperature (so 130 for medium done) but your cooking description says take out at 135! Isn’t that a huge difference? That is a difference for sure! My directions state to take the roast out at 120 degrees for medium and 130 for medium well. Hope that helps. Just checking on the Four Tablespoons of salt. Just wanted to make sure that it is not a misprint. Thank you. Hi Kathy! That is NOT a misprint. It will help you create the paste to flavor the NY strip roast. You will spread this on liberally on the outside of the roast and you may have some left over. But that salt helps to season and marinate the roast. I hope you enjoy! The recipe sounds great. A few questions for you. If I have a 10lb whole sirloin, how does that affect the cooking time? Would you actually double it? Also, would a good bourbon substitute for the brandy, or would that change it too much? Can’t wait to have this tomorrow, it’s already soaking in the rub right now! Sirloin is a bit tougher than NY Roast, so you will want to only cook until internal temp is about 130 and then let rest for 10-20 minutes before serving. It is hard to say how long it will take, as each oven is different, but I would plan on 12-15 minutes per pound. As for Brandy or Bourbon–each work great in the aus jus. 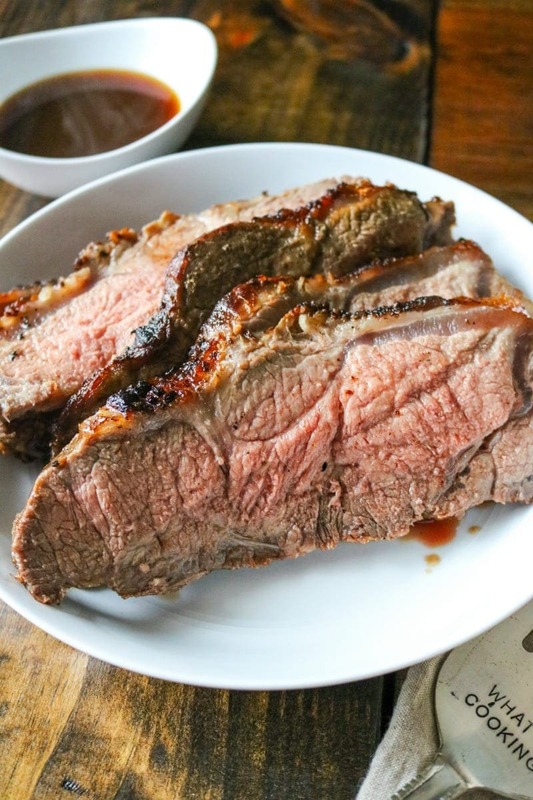 I had a similar strip roast at a restaurant recently and found myself craving it and wondering if I could recreate it today. Let us know how you enjoy! !